Feb. 27, 2018 - In 1999, thousands of hours of dedicated volunteer work and more than 20 years of community input came to fruition with the incorporation of the Harrop-Procter Community Co-operative. The co-operative formed in order to manage public forests surrounding a small community in southeastern British Columbia. In the years since, the work of the co-op, through its management of the Harrop-Procter Community Forest, has come to be internationally recognized as one of the most successful community driven forestry operations in North America. A Wood-Mizer sawmill plays a key role in allowing the co-op to achieve its goals of utilizing ecologically based forest practices to protect the integrity of the community’s watershed forest while also stimulating local employment. The sawmill operation, Harrop-Procter Forest Products, is a subsidiary of the co-op that provides value-added strategies to expand local employment that is so important to the Harrop-Procter community of 600 residents. Each year about 10,000 cubic metres of logs (2,800,000 board feet) are harvested from the 11,300 hectare community forest (28,000 acres) utilizing carefully planned strategies to minimize disturbance to the land and to assure the forest remains fully functional as a watershed. As a measure of sustainability, this strategy would be equal to one small tree harvested per year per acre on average. 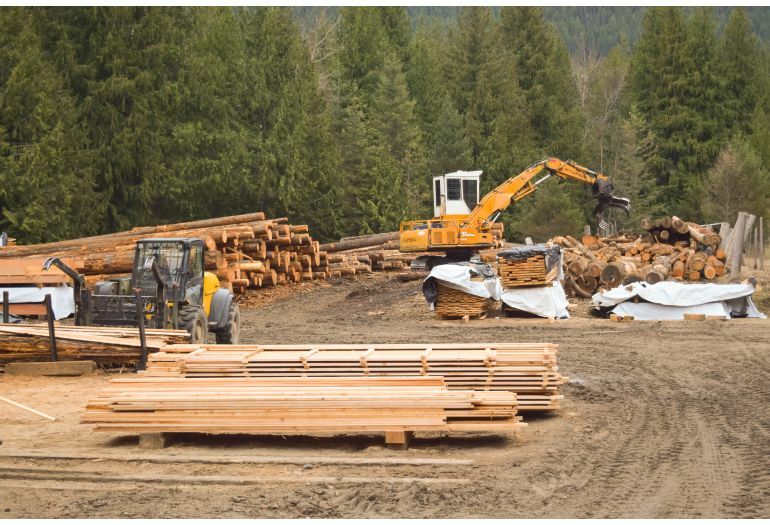 About one quarter of those logs are milled and processed into a broad variety of wood products including both rough sawn and smooth surfaced lumber, trim, fencing, deck boards, timbers for timber framers, siding, flooring, and paneling. The remaining balance of the logs are sold to other area sawmills. Because community forests and similar entities are managed with a broad range of social, environmental, and economic goals in mind, it is a testimony to both the co-op and the mill’s management that while the sawmill and the edger were purchased with a grant from the Columbia Basin Trust, about $300,000 in other debt has been paid, making the mill debt-free today. Public, private, family, tribal, for profit, non-profit, and others responsibly managing a forest would do well to visit Harrop-Procter and watch the sawmill, a model of compact efficiency, at work. The mill is set up to allow for economy of motion and production so there is a lot going on in a small space. Primary log breakdown begins as logs are delivered to a Wood-Mizer LT70 sawmill. Milling takes place all day, every workday, as logs become lumber, timbers, or cants. Coming off the sawmill, rough cut lumber is stacked according to size or routed to a Wood-Mizer EG200 twin-blade board edger for further breakdown. Fibre destined for secondary processing is kiln dried using a Wood-Mizer KD250 dehumidification kiln then processed using a variety of woodworking tools located alongside the cutting operation. 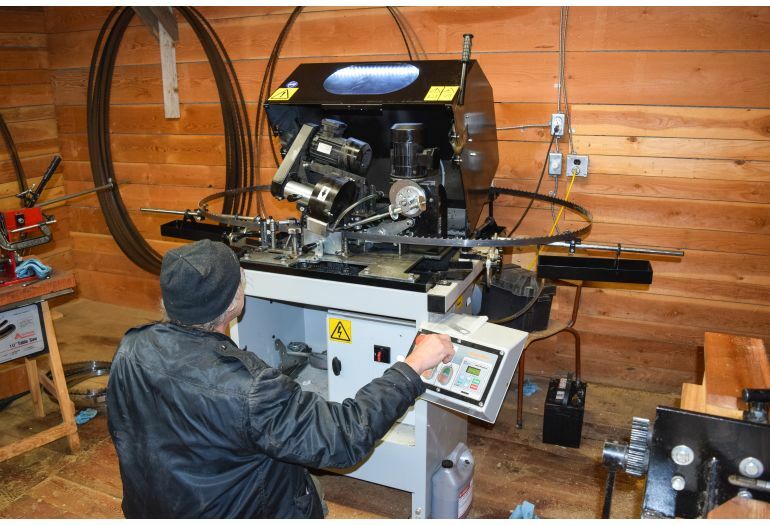 Blades are kept in top condition through the use of a completely outfitted sharpening centre featuring a Wood-Mizer BMS500 industrial blade sharpener. While economically viable, the real importance of the sawmill to the people of Harrop-Procter comes from the mill’s ability to achieve non-economic goals. A full scale clear-cut harvest considered by the province would have concentrated effects on the community’s watersheds into a small timeframe with significant and lasting negative consequences. The in-house sawmill allows the co-op to plan harvests based on solid ecological principles which reduces the effects to the watershed over time in order to maintain water quality and sustainability. This model still allows the watershed to be utilized to create local jobs that would not exist without the mill in place. The proposed full-scale clear-cut harvest would have involved outside harvesting contractors and jobs would have been produced in mills outside of the community. 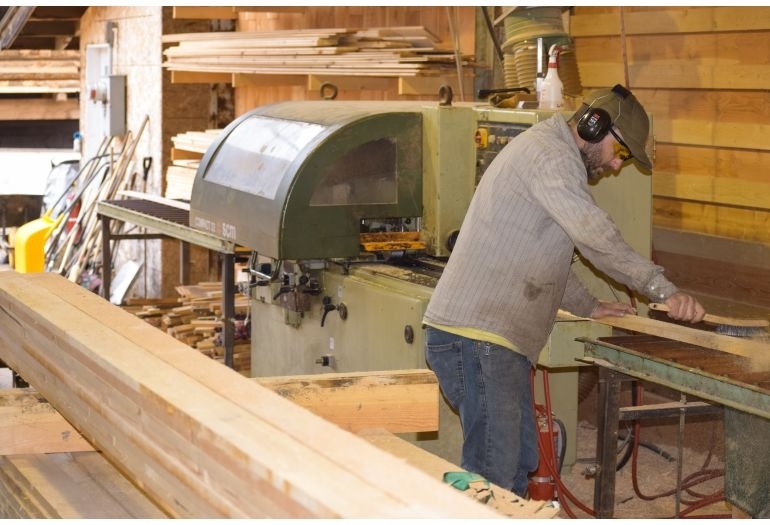 The mill’s sawyer and technical manager David Strom says that Harrop-Procter Forest Products employs five people full time, a half-time forester, a 1/5 time office manager and a 1/5 time bookkeeper. “In the summer we usually hire a few students as well and we hire local loggers and road builders for another two full-time equivalents,” Strom says. According to Rothkop and Strom, other benefits include diverting their timber resources from the waste stream as the mill creates high-end products from some wood a traditional milling operation would consider undesirable or may underutilize. Milling and selling wood locally rather than shipping logs out and then back as finished product also dramatically reduces the carbon footprint of lumber manufactured and used. In addition, Wood-Mizer’s thin kerf blade technology provides for an increase in the amount of lumber recovered from logs. In the 35-plus years since Wood-Mizer first created a viable marketplace for thin-kerf sawmills, the U.S. Forest Service and other research has proven the thin-kerf approach to be one of the world’s major contributors to reduced carbon footprints for construction. Harrop-Procter is demonstrating that environmental, social, and economic benefits to a community can be accomplished through the operation of a sawmill.